Mix together cornstarch, salt, cocoa, and powdered sugar. Add egg whites and stir. You'll think there's not enough liquid, but I promise it'll suddenly start looking like fudge before long! As soon as it does, add walnuts and stir. 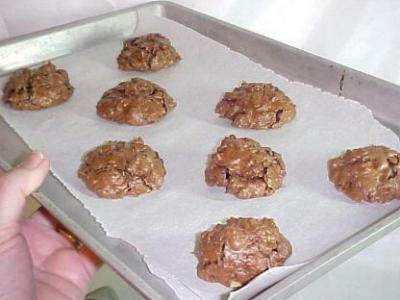 Cover two cookie sheets or pans with parchment paper. Using a cookie scoop (like an ice cream scoop, only much smaller) put 8 balls of dough onto each cookie sheet. Bake at 300 degrees F for about 18 minutes, until they look a little shiny and cracked. Cool for a bit if you can stand waiting. Go on, try, I dare you! 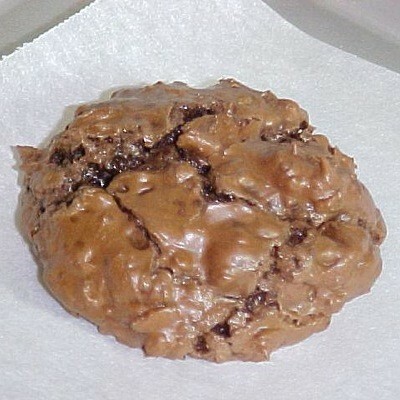 When hot, they are moist and very fudgy inside, with a touch of crispiness on the outside. When fully cooled, they settle into a rich chewy cookie center. Hint: I like to toast the walnuts before putting into cookies, if there's time. To hurry it along, I often chop the nuts, put them in a low microwave safe dish to zap for a minute, stir, and repeat this about 3 more times or until they start to dry a little. Don't microwave too long, it's fine if they're not fully toasted. Source: I think this originally came from a newspaper recipe, but it's been changed over time to make it easier for me to do. I'm dying to try this! We have a big batch of other cookies we have to finish (slowly) first. Thanks so much for sharing. Editor's Note: The main recipe has been changed above. That looks delicious and it's gluten free so I can have it! Will surely try it ASAP. This is one cookie that will go into my cookie collection. I bake for my former co-workers each year at Christmas and always looking for something new to add to the collection. This will be a winner I can tell. Thanks for sharing.